Can a Pre-existing Condition Hurt Your Accident Claim? In Florida, and throughout the country, insurance adjusters closely review every accident claim to find a reason why they shouldn’t pay a claim — they do this when someone falls at a grocery story, when a hotel guest is hurt at a pool or restaurant, or where the other driver causes a car crash — part of that review is to look at the claimant, their behavior and the facts surrounding their claim. In fact, insurance adjusters are trained to investigate a victim’s pain and suffering and lost wage claims and look for reasons to point the finger at the injured person, including blaming the victim, at least partially, for the accident. Experienced Florida injury lawyers expect this “blame the victim” tactic. Another common reason for not paying a claim? The insurance company will review the medical records of the injury victim to see if the victim has any “pre-existing conditions” or “pre-existing injuries” in their medical history. 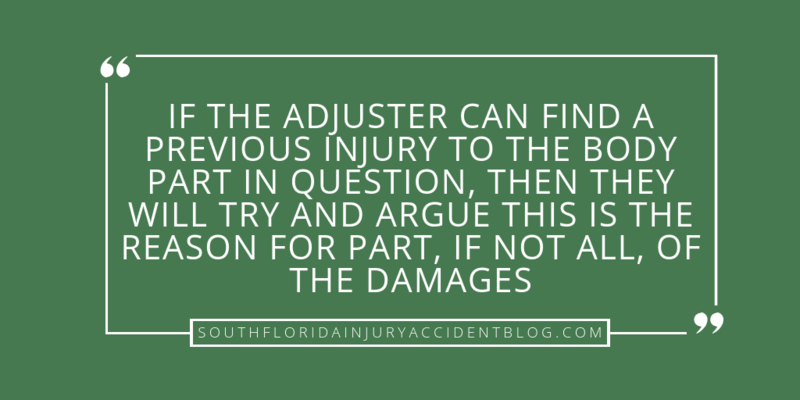 If the adjuster can find a previous injury to the body part in question, then they will try and argue this is the reason for part, if not all, of the damages that the injured person is demanding from their client. If the adjuster can find a pre-existing condition they are likely to deny your claim. When someone has a past medical condition or has previously suffered a bodily injury and they get hurt in a new auto accident or slip and fall, then their prior medical condition or injury is said to be a “pre-existing condition.” Pre-existing conditions are always something that insurance companies look for in their ordinary course of business when a claim is filed against their customer/insured party. Congenital conditions (the victim was “born with it”). Under Florida law, pre-existing conditions can either lessen the amount that the claimant has to pay, increase the amount the defendant has to pay (because of the aggravation of a pre-existing condition), and, in other situations, they have no impact at all and the defendant remains 100% responsible for the injured party’s damages. In Florida, it’s all about “causation.” The question is whether or not the injured person was hurt in a way that is independent of the pre-existing condition and did the new accident aggravate or make the victim’s condition worse. In Ross v. Charlotte County Public Schools, 100 So. 3d 781 (Fla. Dist. Ct. App. 2012), Ann Ross was at work, walking between classrooms in the school hallway when her foot “caught on linoleum flooring” and she fell and was injured. Mrs. Ross did have a pre-existing condition at the time of her injury: she suffered from something called a “vestibular problem” — which she learned about after the accident, as she was recovering from her injuries and being given balance training in therapy. Her employer (the school district) and its insurance company jumped on that information in her medical records like a dog on a bone. They argued that Mrs. Ross’ injuries in the fall were caused by this pre-existing vestibular disorder. They denied her claim. She sued them. At trial, the defendant failed to put on any evidence regarding (1) the nature of vestibular disorders, (2) if Mrs. Ross had any pre-existing condition, much less a vestibular problem; or (3) how her fall was caused by any pre-existing condition. They simply argued that because her type of injuries “may be caused by an idiopathic condition,” because her condition does impact her balance, then her fall wasn’t their problem. The appellate court was quick to point out this lack of evidence — the failure to connect the pre-existing condition to the facts of the accident. Moreover, since this was an accident that happened on the job, workers’ compensation laws applied: and under the law effective at that time, Florida Statutes 440.10(2), “.. compensation shall be payable irrespective of fault as a cause for the injury,” the school district was legally liable for the damages claim resulting from her trip and fall on linoleum flooring in the school hallway. Specifically, the court explained that when someone is hurt in an accident and the defendant argues that their injury is the result of a personal risk — such as an idiopathic pre-existing condition like a vestibular disorder — then that defendant has the burden of proving the existence of such a condition, not the injured person. Important for the accident victim here: if the person who has been hurt can provide evidence that connects the injury as a medical fact with the incident itself, then Florida law will find this is enough to meet the legal test of causation and the defendant will be held liable for their damages. It’s the defendant’s job to come forward with evidence of the pre-existing condition and how it is involved in (and how much it impacts ) the damages claimed. The first thing to know is that a pre-existing condition does not automatically mean that you will not receive compensation from the person who caused your accident or injury. You can expect that they or their insurance company will argue that the amount they should pay to you should be reduced because of the condition. An experienced Florida personal injury lawyer should know how to distinguish (using case law and other techniques, like excluding certain evidence) your current injuries from your prior medical history. Often, this will involve obtaining admissible evidence that includes the expert opinion of a doctor or specialist. A good piece of advice if you have been harmed in an accident and you have a pre-existing injury, is to speak with an experienced personal injury lawyer before you file a claim to learn about some of the issues that can arise with these claims, including the type of evidence needed to prove a claim and the type and amount of damages you can recover. Most personal injury lawyers, like Alan Sackrin, will offer a free initial consultation (over the phone or in person) to answer your questions.